Boil chicken until cooked. Set aside to cool then shred into pieces. Spread chicken in a 9×13 pan or casserole dish and sprinkle ½ of cheese over chicken. Prepare stuffing mix as directed on box and layer over cheese. 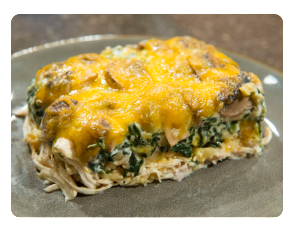 Mix together cream of mushroom soup, spinach, and mayonnaise and lay over stuffing. Layer sliced mushrooms and sprinkle remaining cheese. Pour ½ can of chicken broth over entire area to moisten casserole. Bake (uncovered) at 350° F for 30-35 minutes.